Choosing an engagement ring is one of the most important processes that one will go through. Establishing a budget is the first step, but from there one must select the perfect style that one’s companion will absolutely treasure. Many women prefer a gemstone instead of a diamond engagement ring. One of the most popular diamond alternatives is the sapphire. Sapphires are incredibly hard and score a 9 on Mohs scale of mineral hardness. With the sapphire being the birthstone of September, I thought that it would be appropriate to highlight some of my favorite sapphire engagement rings that deBebians offers. I love the whimsical and unexpected style of this ring. The twisted shank and marquise cut diamonds resemble a vine. For a woman that wishes to have a nature-inspired engagement ring, this is an ideal option. 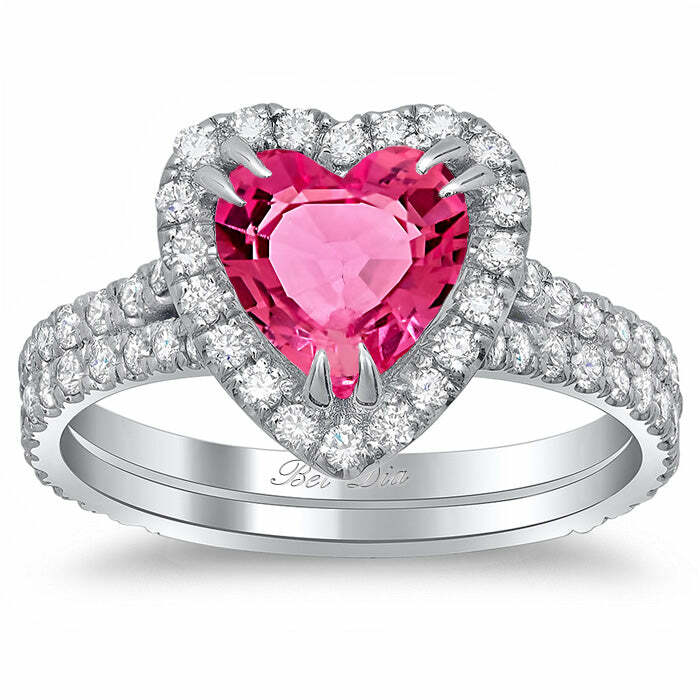 For the woman that prefers the romantic and vibrant color of a pink sapphire, this heart shaped halo engagement ring may be an excellent pick. Select a 1.00 ct, 2.00 ct, or 3.00 ct center stone in addition to the desired precious metal. 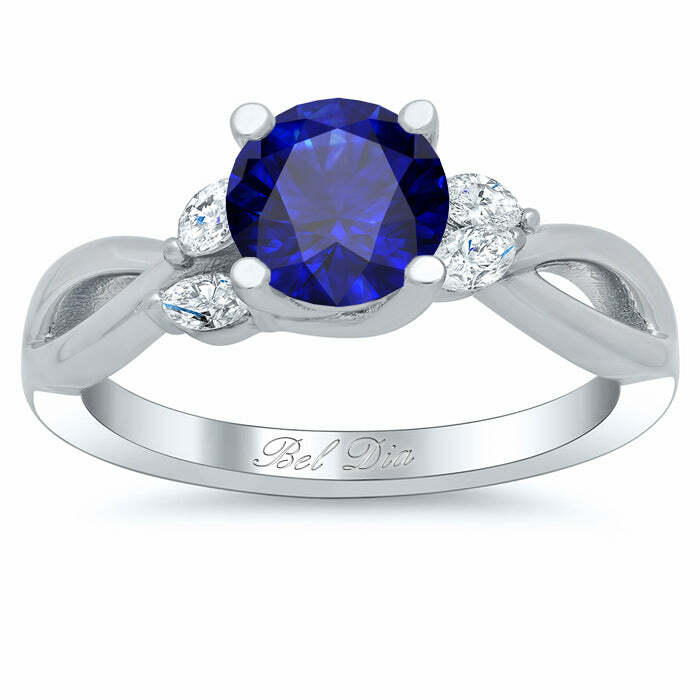 deBebians also offers sapphire accented engagement rings. 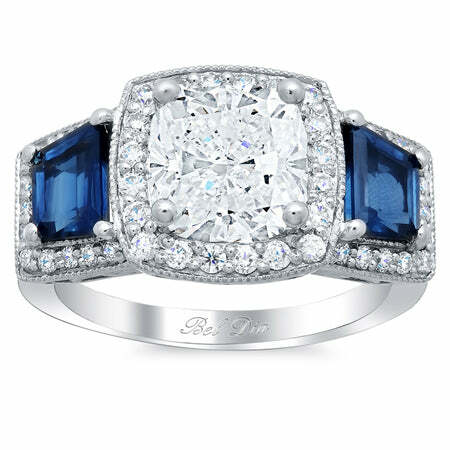 This three stone engagement ring has two blue sapphires that are cut in the shape of trapezoids. Diamonds and blue sapphires are a classic and timeless combination. If you or your partner were born in September, of if you’re anniversary is in September, a sapphire engagement ring would be a lovely and meaningful sentiment. deBebians also specializes in bespoke engagement rings, so please contact us if you are interested in creating a custom sapphire engagement ring by filling our custom engagement ring form.